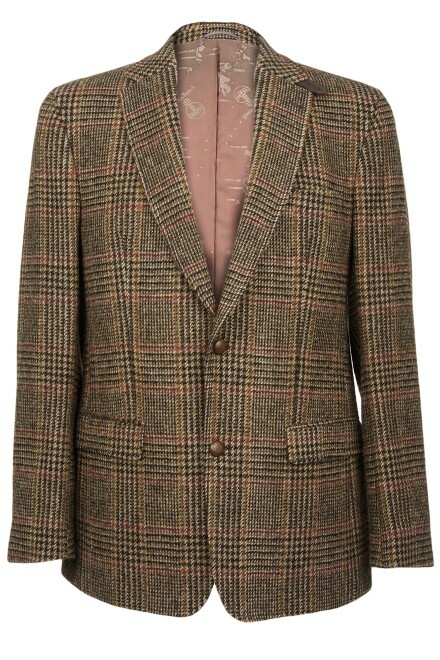 The Barutti Focus jacket is a comfortable, 2 button jacket made from Superfine lightweight Harris Tweed. More versatile than heavier jackets, the Focus is suitable for use all year round. With side vents for a perfect fit, and a less structured shoulder for added comfort, the Focus feels great from the moment you put it on. The Focus jacket has soft suede elbow patches, and a soft two-piece irridescent lining. Decorative silk undercollar and sporty embossed leather buttons complete the look. This is a smart casual jacket that is an ideal travelling companion. A brown, red and green " Prince of Wales " Over Check. A light brown herringbone tweed with a dark vertical stripe and horizontal terracotta stripe.